Given my dyslexia I will never remember how to pronounce or spell this monster. Qalupalik is the inuit iteration of a child stealing mermaid, but unlike most such monsters it is not pretty at all. It unclear how old it is, but the stories of this monster have been told as long as they have lived in ice ridden lands. There are a few stories of the Qalupalik in Inuit lore, in all of them it is a humanoid monster that is found near coastal waters of these icy lands, and makes a humming/clicking noise,1)like ice just beginning to crack and if a child gets too close the Qalupalik will rear up and steal them in the amauti 2)what Inuit use to carry child on their back around the back of its neck. It then takes the child to its watery world – but it does not kill them quickly, it slowly drinks their lifeforce, and as the child gets older it gets ever younger. The child can be saved but they are forever changed. It seems to be a cautionary tale, to keep child away from water and thin ice, using things that are easily recognised, like the green seaweeds and humming noise which is the ice cracking – which is dangerous for everyone, but especially for childen, since people can fall into the water through cracked ice and then be unable to surface. 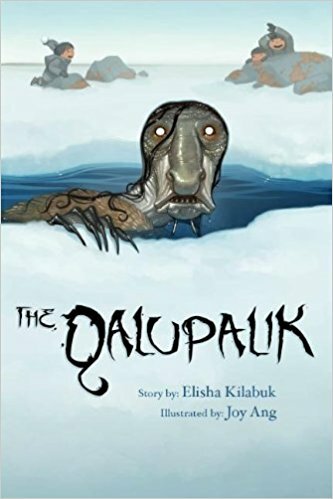 The Qalupalik isn’t seen much in media, there a few children fairy story books and books about Inuits people and a few short films, but for the most part this tale has failed to grab the public eye in the way that many other monsters have. Very long green seaweed-like hair that runs down to the base of their back. It has a long, slim body with an amauit on its back – sometimes this is not made of clothing but their sagging skin. It has green slimy skin all over them. It’s usually found near the ice coast, watching the water for children but it is careful to strike only when the child is alone – it won’t risk its life to catch or keep them. Run an adventure where you have to save the child from one. The Qalupalik will not put up much of a fight – except against very weak adventurers – but the environment may. A story or a game where a bad guy is trying to steal its power, allowing them to drain life from children. One where it’s told from the point of view of a Qalupalik hiding in plain sight. It would mean a lot of makeup, and they would likely seek to work with children in order to drain small amounts of life force from many individuals – keeping their feeding hidden.